Co. Mayo: Ballindine, Ballyhaunis, Ballyhowly, Bekan, Caraun, Claremorris, Cloghermore, Course, Crossboyne, Culnacleha, Garrymore, Kilcolman, Kilvine, Knock North, Knock South, Loughanboy, Mayo, Murneen, Tagheen. The Guardians met at noon on alternate Wednesdays. The burial ground for the workhouse was just off Mount Street to the north-east of the town centre (shown at the far top left corner of the map). A fever hospital is supposed to have stood on Mount Street prior to the erection of the workhouse. Anyone dying in the workhouse, whose remains were not claimed by a relative, would be buried in an unmarked grave in the burial ground. The pauper's graveyard was also used for the burial of unbaptized infants, which usually took place during hours of darkness. This practice apparently continued long after the closure of the workhouse. The workhouse closed its doors in 1918 and the buildings were used by the British army as a barracks between 1918 and 1922. In 1930, the Minister for Local Government and Public Health granted a lease on the site to Messrs O'Mara and Co. of Limerick, and in 1933 the Claremorris Bacon Company began operating from the premises. Bacon processing continued up until April 1989 since when the buildings have become derelict. 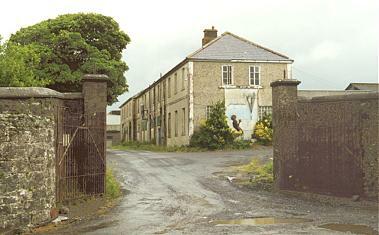 Claremorris former workhouse entrance from the east, 2000. 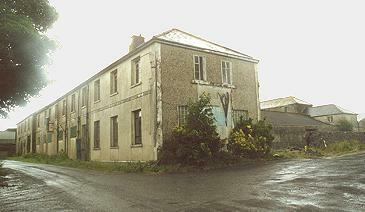 Claremorris former workhouse from the east, 2000.